Amy's favorite pastry wheat is planted in the fall near Ithaca. With the harvest from this past summer finishing up, and Thanksgiving just ahead, we figured it would be a good time for some thinking and discussion about local food. So, it's Following Food Week here on AOA. We start things off with a look at the effort to re-grow this area's grain industry. Grains are so foundational and basic that we don't give them much thought. I certainly never gave them much mind, even though I'm a heavy baker. Until five years ago, I had two facts about flour: I knew I liked King Arthur, and that I loved the taste of whole wheat. Then, I had a cookie that introduced me to fresh, locally-grown oats and wheat. The flavors were so vibrant I had to follow that food back to the field. And I'm here to report that the road to local wheat is tough traveling. The road to any food is long. I had a hint of how hard it is to produce fresh local food because I ran the Troy Waterfront Farmers' Market in its early days, long before the concept of local eating had a good strong foothold. From jobs in restaurants and many happy hours in my own kitchen, I knew what it took to cook and feed people but the other end of eating was a surprise. No matter how impressed I was with the labor of love and dedication farmers put in 24/7, I was still shocked by how much effort it takes to get grains to local tables. Flour and malt are late to the local food game because they require so much more processing and handling en route. A tomato, peach, or egg can travel relatively easily from farm to table. Milk, cheese and meat take a lot more equipment, and get a lot more regulatory oversight. The big daddy of time, tools, and capital, however, is grains. Flour and malt are late to the local food game because they require so much more processing and handling en route. A tomato, peach, or egg can travel relatively easily from farm to table. Milk, cheese and meat take a lot more equipment, and get a lot more regulatory oversight. The big daddy of time, tools, and capital however is grains. Grains are a land hungry food. Production of them drifted out of the Northeast as soon as the Erie Canal carved a path first to Western New York, and then to even better ground for farming in the Midwest. Advancements in transportation, as well as agricultural and milling technology, developed grain belts in areas with dry summers and big, flat fields. Here in the Northeast we lost track of this basic foodstuff and tucked it out of mind and out of sight. Re-localizing farming, milling, and malting means a large investment. First there's the land, because you need a high volume of this crop to pay the bills. Then there's equipment like seed drills, combines, harvesters, and grain bins. Not to mention seed cleaners and dryers, to get the moisture content right for storage and ward off spoilage and pests. All of that needs to happen on a farm. Next, a farmer needs a mill or malthouse to buy the crop. In New York, this facility has to meet standards set by the state Department of Agriculture and Markets, so again, there is a layer of investment. Next, millers and maltsters need bakers and brewers who can use this product, which if you add up the prices of the other two required pieces, cannot match the commodity prices of out-of-state products. Can you see why rebuilding a regional grainshed is a tall order? And yet, we had farmers, millers and maltsters in the Northeast. In 1901, there were 77 malthouses in New York State! This map is from GrowNYC, which has info about local grains throughout the Northeast. We have some now -- nine and counting -- and I am hoping that as people discover the flavors of fresh flour and malt, and learn the economic value of having this agriculture and agriculture related businesses in the region, supply and demand will go forward. This will increase the acres devoted to food grade grains, and the number of mills and malt houses. Luckily, in New York there is an economic incentive to redevelop barley farming and malting. The 2013 Farm Brewery law tied licensing to use of agricultural products from the state. Meeting the need of these breweries is tough, because malting barley hasn't been grown as a crop for at least 60 years. Farmers and seed companies in the Northeast have lost track of seed varieties that will do well in our climate. There's a lot of people collaborating to help get barley and malt production going again in New York and the region. When I first started learning about people growing grain near me, I was struck by the interconnected nature of this work. How the farmer and miller needed to talk about the crops. How the baker needed knowledge from each of the others. Learning how researchers are helping identify seed varieties, growing practices, and processing equipment to help make food-grade grains a reality for consumers really involved a group effort. The work seemed graceful and massive, like a pitcher winding up to hurl a ball to the batter. A great human muscle was at work, reliant on all the other muscles, ligaments, and bones in the system. This body metaphor can stretch to fit over the land, also. Because eating is an act of people coaxing plants, we need more cooperation to work together for the health of the system. Growing grains is part of a diverse farm ecosystem, and economy. 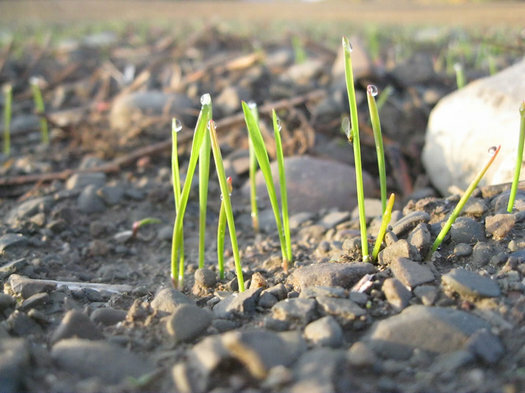 Crops grow susceptible to pests and diseases when planted in the same place year after year; having variety within a farm system supports soils. When farms have a variety of crops to sell, there is more protection within a weather-dependent enterprise. 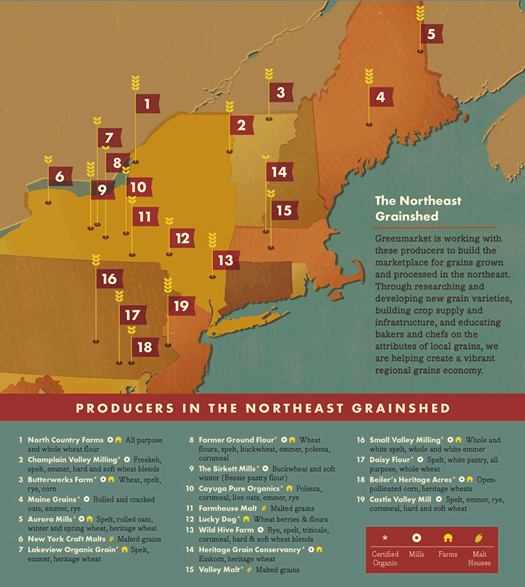 The Greenmarket Regional Grains Project has put together a grainshed map of the Northeast that illustrates the many grain related enterprises that are getting local staples ready for bread and beer. Take a look and see what you want to try. Honest Weight Food Co-op sells some state flours. And Farmer Ground Flour, which stone mills organically-grown New York State grains, is my favorite. Homebrew Emporium in North Greenbush sells products from Valley Malt, the pioneering malt house in Hadley, Massachusetts. And don't forget to ask your baker and your brewer if they use ingredients from near here. If they don't, maybe your request will help change that. Using a blender or whisk, mix until everything is incorporated. Let the batter rest for at least 15 minutes, or in the fridge overnight. You want all the ingredients to combine well. After resting, the crÃªpe batter should be as thin as melted ice cream. I mention this because flours vary in how much liquid they absorb according to humidity, the amount and shape of the bran pieces, and the type of grain. As you get comfortable making crÃªpes, you'll get a feel for each flour, and how much liquid it needs. Heat the griddle until water dances on the surface. Use half a tablespoon of butter for each crepe. (The amount of batter will vary with the size of your griddle.) Pour about a quarter to a scant third of a cup batter onto a 10-inch griddle, tilting so the batter reaches the edges. Flip after the first side stops looking shiny. Serve with everything -- savory or sweet. 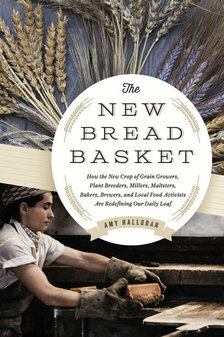 A love of flour prompted Amy Halloran to write The New Bread Basket: How the New Crop of Grain Growers, Plant Breeders, Millers, Maltsters, Bakers, Brewers, and Local Food Activists Are Redefining Our Daily Loaf, which was published this past August. She lives in Troy and eats pancakes almost every day. Been reading her book this past week, as well as toying around with some flour (Farmer Ground) she dropped off at Pecks. Really hoping to start using a wider variety of grains and cereals at Peck's and Little Pecks. Looking forward to seeing more grains in Troy! In Germany the whole grains (unmilled) are sold on the shelf next to the milled flours. There is nothing like the taste and texture of a spelt waffle using the unhomogenous flour you get when you mill the grain fresh yourself. I finally bought a mill here to replace the one I left behind when I left Germany. Now I am looking for grains in the Albany region. Do you have any tips where these can be purchased? Dot - I would start with Honest weight co-op, I-90 exit 5 in Albany. @Dot: I would recommend the Honest Weight Food Coop (http://www.honestweight.coop/). Even if they don't directly sell what you are looking for, there's a lot of institutional knowledge here and they extensively network with local producers, so they can most likely point you in the right direction.